Data-sharing systems—where healthcare providers jointly implement a common reporting system to promote voluntary reporting, information sharing, and learning—are emerging as an important regional, state-level, and national strategy for improving patient safety. 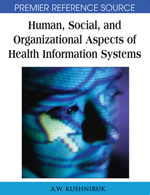 The objective of this chapter is to review the evidence regarding the effectiveness of these data-sharing systems and to report on the results of an analysis of data from the Pittsburgh Regional Healthcare Initiative (PRHI). PRHI consists of 42 hospitals, purchasers, and insurers in southwestern Pennsylvania that implemented Medmarx, an online medication error reporting systems. Analysis of data from the PRHI hospitals indicated that the number of errors and corrective actions reported initially varied widely with organizational characteristics such as hospital size, JCAHO accreditation score and teaching status. But the subsequent trends in reporting errors and reporting actions were different. Whereas the number of reported errors increased significantly, and at similar rates, across the participating hospitals, the number of corrective actions reported per error remained mostly unchanged over the 12-month period. A computer simulation model was developed to explore organizational changes designed to improve patient safety. Four interventions were simulated involving the implementation of computerized physician order entry, decision support systems and a clinical pharmacist on hospital rounds. The results of this study carry implications for the design and assessment of data-sharing systems. Improvements in patient safety require more than voluntary reporting and clinical initiatives. Organizational changes are essential in order to significantly reduce medical errors and adverse events.